Note: this post is evolving with us as we get better working with dough and change dwellings and available equipment. Sarah found this recipe a few days ago, and we’ve been drooling about it ever since. Still measuring your ingredients by volume (cups, fl. oz.)? You must like washing dishes. Mix everything in a large bowl by hand or with a wooden spoon or something. Don’t make it too complicated. When you’ve got the dough formed into a ball, transfer to a different bowl coated lightly in oil. Or it could be the same bowl — that’s fine. Do the oven rise, or the steam oven rise, but not both! This is the big advantage of our new4 kitchen. The steam oven cuts the rise time dramatically. Set your steam oven on “dough proofing” or similar. We set ours to 30 °C — that’s as low as ours goes. Let it rise in there for 2 hours. Cover the bowl tightly in plastic wrap. Let it rise in a warm place for up to six hours. We used our oven for this — set it to 50 °C for a few minutes at a time to keep the temperature warm and pleasant for the yeast to feel productive. It’s done when it’s more than doubled in size. You need the in-pan rise no matter what. Coat your cast iron skillet in olive oil: bottom and sides. Use your hands, and get them slippery, too. Grab the dough out of the bowl and form it into a ball, turning it inside out a few times in your hands. Spread it out as evenly as you can in the pan without tearing it. It will resist, so stretch the dough repeatedly in multiple directions to coerce it. If it does not reach all the way the walls of the pan, do not despair: during the next rise and subsequent bake, it will. Do an in-pan rise for an hour. We use our oven for this; you may have another warm place for dough to rise. Set the oven as low as it will go — ours won’t go lower than 50 °C — and let the dough rise in the pan for an hour. You can make the sauce and prepare the toppings while you wait. Take the pan out of the oven (if the in-pan rise was happening there) and crank it up as high as it will go. Ours maxes it out at 250 °C. You might want to put a pizza stone in there or a baking steel or something to keep the temperature high and stable. We found that that’s really not necessary with a convection oven, but it worked well with our conventional oven in the past. Do two bakes — one just for the crust and sauce, and one for the toppings. You give the crust a head start and dry out the sauce a little bit with the first bake. We’re going for a golden, crispy bottom layer, with medium-crumb airiness in the middle. 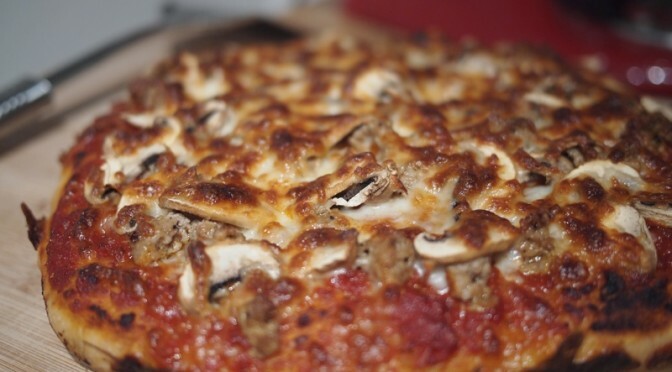 Spread the sauce on the dough as far out to the edge of the crust as you dare. When the oven is preheated, put the sauced pie in your cast iron skillet in for 10 minutes. It should start to brown a little by the time you take it out. Take it out and apply the rest of your toppings. Bake for another 10 minutes, or until the cheese is largely browned. Use a wide metal spatula to flop the pie onto a wooden cutting board. It should come out pretty easily thanks to the olive oil coating you gave the pan before starting the in-pan rise. Let it cool for a few minutes before cutting it into servable pieces. If you fail to wait for the pie to come down to a reasonable temperature, you will burn the heck out the roof of your mouth. Enjoy it anyways. The bottom crust didn’t come out quite as crispy as we’d hoped. Next time we make one, we’ll finish the bottom on a stove burner and note our findings. Wow, Cliff, that looks just so delicious. Too bad we don’t have a cast-iron pan! Do you think it would work just on a flat baking sheet anyway? How thick was that crust in the end? That’s an interesting note about the wimpy yeast. I’ve never noticed a difference, but then again I’ve been slowly drawing down my mega-supply jars of Fleischmann’s taken home from Canada. I think I recall telling you about salt killing yeast. At least that’s what I read in The Bread Bible, so I’m careful to add it after a bit and not right away. Never had a problem so far. I’m going to let you in on a little secret: this is our second attempt with this recipe. The first attempt, we didn’t have a cast-iron pan, either. What we used then were enameled steel pie pans (Dr. Oetker brand; found ’em on Amazon). Those mostly worked too. I think whatever you do, you’re going to need a pan with walls for this dough. The final rise is in the pan, and the yeast are stretching those strands of gluten as far and as wide as they can across the olive-oil slicked surface. Of course, if you’re going to not go the no-knead route, then you don’t need as much moisture or the yeast to get their stretch on. You’ll be doing that for them. So, I would guess that going panless implies going non-kneadless. You are correct sir, that the salt tip came from you. It was here: the thread on our expat blogger discussion board comparing yeast. I am pretty sure it was Mausi who told me about the enzymes on some people’s hands, but I couldn’t find any evidence of that. That crust ended up being just about an inch tall. While we were in Rome last month, we sought out a particular pizza joint with rave reviews, and it had fluffy, soft crusts under luscious cheese and sauce, partially pre-baked in the display case, waiting for me and Sarah to come along and request the full-on bake and snarf it up. Sarah and I both have been lamenting the lack of thick-crust pizzas here in Germany (barring Pittsa Hoot). But not anymore! One thing I think our recipe write-up forgets is that we pre-heated our pizza stone as high as the oven would go for about an hour, trying to get a high, even heat on the top and bottom of the pan. Our toppings got critical before the bottom crust, so like she said, we’re going to try a stovetop finish on the next attempt. On cold winter days like these, I don’t mind the extra heat leaking into the kitchen. 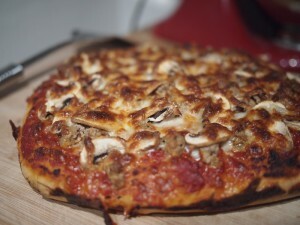 One of my favorite memories of my grandmother’s kitchen is when we made pizza. First I got to use my hands to spread the oil on the pan. Then Aunt Mary flopped a hunk of dough on it and told me to make it fit all the way around, especially into the corners. I never could get it to stretch and she always had to help, but I remember that I got better at it. That particular movement, fingers together and hands straight, was more like harassing the dough to the edge of the pan. Yours looks delicious. Congratulations for pursuing perfection! Thanks! It was outrageously good. I like the typical thin pizza you find around most of Germany, but when I have that visceral, bone-deep ‘pizza’ craving, I want this stuff. After reading this, I’m not entirely convinced that the German yeast is wimpier. Maybe our kitchen is just too cold (though we provide warm rising areas) or we are missing the windows by letting stuff rise TOO long or overyeasting such that the gas is consumed before the flour is ready to stretch. So we must press on in the relentless pursuit of pizza (and bread in general) perfection! Another hint: it seems to work really well to put the pie in with just the sauce for 10 minutes first, and then take it out and quickly dress it with the toppings before baking it an additional 10 minutes. That way we didn’t need to finish the bottom of the crust on the stove to firm it up and it was fully baked all the way through to the toppings layer. Thanks to “Tuscan Foodie” on the Serious Eats site for this tip! The ingredients list as above. Put the salt in with the fresh yeast — it doesn’t hurt it and it’s a lot easier to get the salt distributed throughout the dough if it’s mixed in with the flour first. About 8 hours is the max this dough will rise — it’s ready after that, and if you let it go much longer than that, it’ll over-rise, collapse in on itself and not be (as) good. Bake the sauce onto the crust for 20 minutes, then dress the pie with toppings and bake until the cheese is nicely melted — about another 7 minutes. Be sure that oven is good and hot when you start the first bake. Previous Previous post: WEBMU — is it not just for bloggers anymore?